Come discover the beauty of Leh with us. 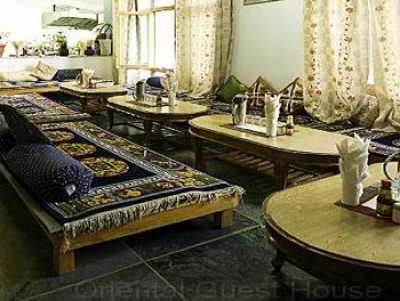 Away from the town centre and commanding stunning views across the Leh valley, the Oriental Hotel & Guest House is a world apart from the bustle and noise - an oasis of calm. Each room looks out over Leh, the palace and the valley beyond, and because we can sleep up to 50 people we are able to offer levels of luxury and comfort to suit every taste. See some photos of what we have to offer you. We built the guest house ourselves in 1987 and have been running it on our own ever since. It is family owned and family run, so you know that the money you spend here will stay in Ladakh. Doctor on Call, Room Service, Family/Child Friendly, Restaurant, Baggage Storage on Request, Parking, Security Guard, Exhibit Space. Desk, Toothbrush/Razor on Request, Bottled Water in Room, Cable/Satellite TV, Television Room, House Keeping, Attached Bathroom, H/C Water. User reviews for "Oriental Guest House Leh"